OFFICIAL NOVINT BLOG: Falcons in the Wild! Thanksgiving is almost here and many of you probably have a very important bird on your mind… the turkey. But we don’t want you to forget about another important bird… THE FALCON! The Falcon is out in the wild now, and you can see them at a number of retail stores nationwide. 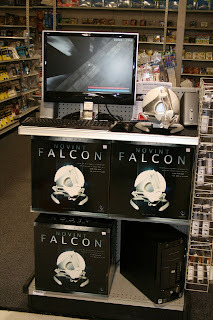 Check out this picture of the Falcon at J&R Music World / Computer World. And here’s a picture of the Falcon at a CompUSA. 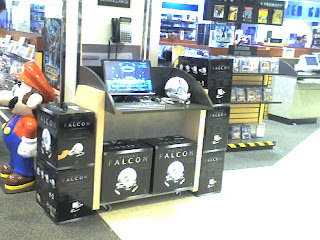 You can stop by any of the following retailers to check out the Falcon: CompUSA, J&R Music World/Computer World, Fry’s Electronics. Or, if you’re flying for the holiday, be sure to check out the Falcon in the current issue of Sky Mall. And don't forget to check us out online at www.tigerdirect.com, www.gogamer.com, and of course, www.novintfalcon.com. Have you seen the Falcon in the wild? Let us know! Even better, email us a picture of you trying out the Falcon in the wild (pr@novint.com) and we just may post it on our Blog or MySpace page! Have a great Thanksgiving!